From thriving Motor City to the largest municipal bankruptcy in American history, Detroit has become the nation's cautionary tale. But what led to the fateful day of the filing, and how did the city survive this crisis? 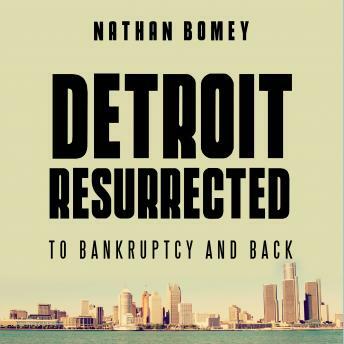 Journalist Nathan Bomey delivers the inside story of Detroit's decline and the people who fought to save it against impossible odds: governor Rick Snyder, a self-proclaimed nerd; emergency manager Kevyn Orr, a lawyer with singular dedication; judge Steven Rhodes, the city's conscience; and retirees who fought to ensure that Detroit kept its promises. In a tightly reported narrative, Bomey reveals the tricky path to the Grand Bargain that would determine the fate of pensioners, city services, and the world-class Detroit Institute of Arts, which faced the threat of liquidation. Detroit Resurrected offers a sweeping account of financial ruin, backroom intrigue, and political rebirth in the struggle to reinvent one of America's great cities.